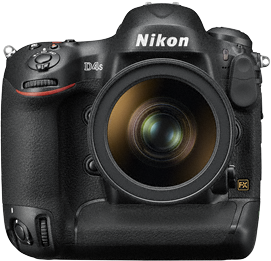 Nikon recently released a firware update for it flagship D4s camera. - When NEF (RAW) recording > Image size in the shooting menu was set to RAW S (Small), the number of shots possible with uninterrupted shooting (buffer capacity, C-REM) displayed by the camera differed depending upon the NEF (RAW) recording > NEF (RAW) bit depth setting selected. - When Camera Control Pro 2 was used to take pictures with Record to set to PC+CARD, and Secondary slot function in the camera's shooting menu set to Overflow, the shutter could not be released when the memory card in the primary slot became full. - When Image review in the playback menu was set to On, images were sometimes not displayed in the monitor when the shutter was released while exposure meters were off. - When images were output to an HDMI device, resolution seemed insufficient with display in full-frame playback mode (did not apply to playback zoom display). - When images, captured with Image review in the playback menu set to On, and Auto distortion control in the shooting menu set to On, were automatically displayed in the monitor immediately after capture, auto distortion control was sometimes not applied. - When the multiple exposure function was used to capture images with Image review in the playback menu set to On, and Auto distortion control in the shooting menu set to On, auto distortion control was not applied to the recorded images. - When an image to which an image comment had been added was copied to White balance > Preset manual, only the first 24 characters of the image comment were copied. - If log-in to the FTP server failed when network settings were applied with Wired LAN selected for Network > Choose hardware in the camera's setup menu, and FTP upload selected as the connection type and IP address acquisition set to Obtain automatically with the Connection Wizard, the IP address displayed when the camera tried again to obtain it automatically was "000.000.000.000". - When a movie recorded at a frame rate of 30p, 25p, or 24p was played back on a TV to which the camera was connected via HDMI with HDMI > Output resolution in the the camera's setup menu set to 1080p (progressive), display on the TV was distorted. - When a file containing an IPTC preset (IPTC information) that included double-byte characters in its profile was copied to the camera, the camera froze when attempting to view the contents of the IPTC preset. - When Add items was selected for My Menu, OK was displayed even for items that cannot be added. - When Language in the setup menu was set to Arabic, text and icons in some menu displays overlapped, and text was positioned too far to the right.